Have you ever wished you knew less about a video game before playing it? Commenter Sloopydrew played through ThatGameCompany's magnificent Journey twice before realizing he had missed an important bit of information. Imagine his surprise in today's episode of Speak Up on Kotaku. 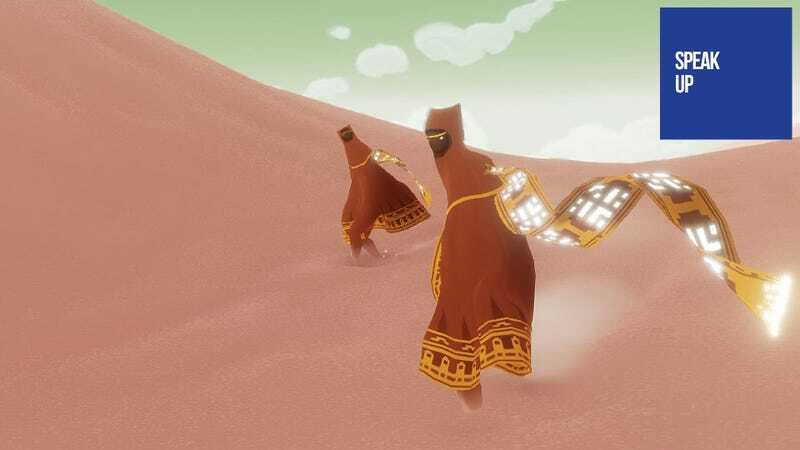 I just finished Journey for a second play through, sat through the credits this time (which I didn't the first time) and found something out — you're playing with actual people! I had no idea those were people! I thought they were NPCs meant to guide me (now I know why one of the NPCs kept following me, instead of showing me what to do).